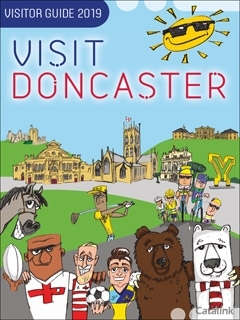 To order a printed copy of the Visit Doncaster brochure, simply click the Request button below. View the Visit Doncaster Online Brochure Now! Visit Doncaster invites you to experience a stay in a flourishing town that you'll never forget. Order the new visitor guide today to start your journey here! Doncaster has so much for visitors to do and a lot to be proud of, whether that's its racing calendar including the classic St Leger Meeting in September, the UK's number 1 walk-through Wildlife Park or Europe's biggest and best paintball and multi-activity centre. There are historic buildings in abundance, fabulous museums and lots of open green spaces for you and your family to explore. There's also an impressive list of annual events in the town from May to Christmas as well as theatre, a thriving live music scene and much, much more... so what are you waiting for? Visit Doncaster Brochure Kinna M. said: Quite a comprehensive guide. Visit Doncaster Brochure Phil C. said: A glossy, high-quality production that was eminently readable and understandable. An impressive brochure. By pressing the Request Printed Brochure button you give consent to Visit Doncaster (and their Data Processors for the specific purpose of delivering your literature) to send you their Brochure .